March has just dragged on and on, hasn't it? I'm reading through my list of favorites and I feel like I loved these things months ago, not weeks, with the exception of the beauty products I purchased at the beginning of the month and have been using everyday. 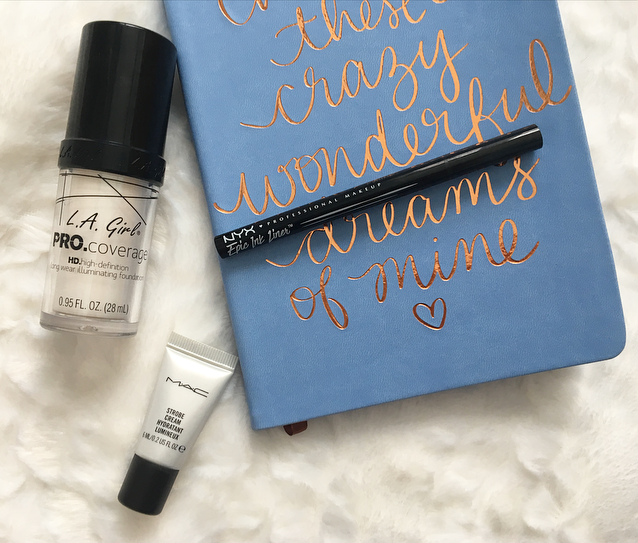 The first product is an absolute lifesaver, the LA Girl Pro Illuminating foundation in the white mixing shade. My skin has gotten so much paler in the past few months and it's made me very self conscious about my foundation not matching. Enter in a white mixer, and this problem is solved. I've been using it everyday with a variety of foundations and it works really well, definitely one to check out if you have a lot of darker foundations. I've been mixing other things into my foundations, too. I have a few little samples of MAC Strobe cream floating around and had never really used them as I prefer powder highlights, but a little drop or two into my foundations makes it even more glowy and beautiful! I really love the effect. The last beauty item that I can't rave about enough is the NYX Epic eyeliner pen. This is supposedly a dupe for the Kat von D Tattoo liner. I haven't tried the Kat von D offering, but considering how good this pen is I could see it being sold for twice the price! It has a strange applicator, pointed like a felt-tip but it feels more silky than a felt tip. It glides on so smooth and black, and it stays in place all day. It's so easy to get a wing with it. I'm obsessed! This month I finally got around the watching the second installment of the Maze Runner trilogy, the Scorch Trials. I read all the books a couple of years ago and I liked the first movie, but I hadn't watched the second. I think that I like the Scorch Trials book more than the movie, but it was still gripping and a good one to watch for sci-fi lovers. Several TV shows impressed me this month! Towards the end of my spring break I started watching Sweet Vicious, an MTV show about two girls who hurt rapists on campus, and Riverdale, a CW drama about a boy named Archie. I finally finished watching the Lying Game series, which was canceled a few years ago and ends on a cliffhanger! It's about separated twins who take each others places and have to try to find their birth parent while juggling a few other mysterious things. If you like Pretty Little Liars I think you would like it because it's based on a book series by the same author of PLL. As for books, I fell in love with one called I'll Give You the Sun. It's about two twins, Jude and Noah, who are both very artistic but other than that very different. It flips between Noah's point of view when the twins were in middle school, and Jude's point of view a few years later. The twins had a major falling out and have to find their way back to each other. There's a bit of romance and the writing is just beautiful. The last new favorite of mine is my tattoo! I got one at the beginning of the month, a little seashell just below my right ankle. It didn't hurt too bad and I love it. When it heals up completely I will probably post a photo of it on Instagram! Also my monthly donation was made to the Alzheimer's Association. I learned a lot about it this month for a Physiological Psych project and research for it is so important. I would love to know what your favorites are this month! 5 comments on "March Favorites"
I love MAC Strobe Cream! i want to grab the white shade of the LA Girl Pro Illuminating foundation ! I am hearing great things about it and it will be very useful for me. I think I'll have to get the mixer! I am awful at picking my right shade in foundations, if they are too light there is no much problem because it can be fixed with some bronzer, but if they are too dark they are a nightmare! I have to try the Nyx Eyeliner Pen, I tried their regular black eyeliner and it is the mattest I have ever tried, I love it. I'll Give You the Sun seems like a lovely story. I´ll add it to my reading list, thanks for the recommendation! I want to try the NYC liner! And I'm not a tattoo person but if I were to get one, it would be on my foot, wrist, or ribcage!